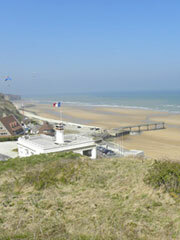 Omaha Beach is the code name for one of the five sectors of D-day. The beach is located on the coast of Normandy, France, facing the English Channel, and is 5 miles long, from east of Sainte-Honorine-des-Pertes to west of Vierville-sur-Mer on the right bank of the Douve River estuary. Landings here were necessary in order to link up the British landings to the east at Gold Beach with the American landing to the west at Utah beach, thus providing a continuous lodgement on the Normandy coast. On D-day, the 29th US Infantry Division, joined by 2nd Ranger and 5th Ranger Battalions redirected from Pointe du Hoc, were to assault the western half of the beach. The 1st US Infantry Division was given the eastern half. Omaha was divided into height sectors, codenamed (from west to east): Charlie, Dog Green, Dog White, Dog Red, Easy Green, Easy Red, Fox Green and Fox Red. Very little went as planned during the landing at Omaha Beach. Difficulties in navigation caused the majority of landing craft to miss their targets throughout the day. The defenses were unexpectedly strong, and inflicted heavy casualties on landing US troops. Weakened by the casualties taken just in landing, the surviving assault troops could not clear the heavily defended exits off the beach. Small penetrations were eventually achieved by groups of survivors making improvised assaults, scaling the bluffs between the most heavily defended points.